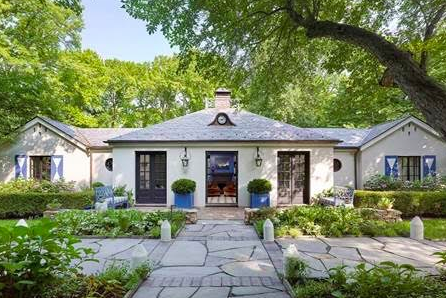 Noted interior designer Ernest de la Torre has just listed his vibrant, chic home for $3.6 million in the historic, artistic community of Sneden’s Landing. Located just a short walk to the Hudson River, the home gets its nickname from a focal point above the home’s entrance way: a European style clock that protrudes from the slate roof. De la Torre, who has been included in Elle Décor’s list of 25 Top Interior Designers, the Luxe Gold List and Architectural Digest for his work, transformed the home with extraordinary architectural design, full of curated experiences at every turn, down to the smallest details. In addition to perks like his and her en suite bathrooms in the master, the home also features details such as walls stamped in gilded leather from Paris, an 18th century fireplace mantel from London and wood beams from a 19th century barn in Pennsylvania. The listing agent is Richard Ellis of Ellis Sotheby’s International Realty in Nyack, New York.